How to Make Banana Juice Special Favor .Is actually almost the same as when making fruit juice in general. The tools needed will not be much different. Bananas used should be ripe bananas. Bananas itself has a wide variety of content that is very good for the human body. Besides processed into juice, not infrequently also bananas processed into snacks such as fried bananas or banana compote. But the most healthy banana processed form of juice because it is not through the frying process or the other. Banana juice can also be combined with a wide range of additional materials. For example, as will be discussed in the following article, a combination of banana and oat juice and pineapple. Here are a few variations of how to make banana juice that maybe you can try at home. First set up in advance blender. Then peel the bananas and cut into small sections. With the blender so it will be easier to smooth bananas. Put the piece of banana into a blender and add sugar or honey according to taste. If you want to make banana juice with a combination of pineapple, the pineapple and bananas should advance simultaneously cooled in the refrigerator then newly blended together sugar and honey. Next add your favorite combination of ingredients, such as milk powder, oats, and yogurt. You can add ice cubes to be increasingly felt fresh juice. With a combination of oats banana juice or pineapple is ready to serve. Usually people replace breakfast or dinner with juice. This is one form of a healthy diet. 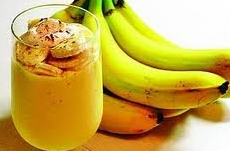 You can also change your breakfast or dinner with this combination of banana juice. It's better if it was served without sugar or sweetener is not too excessive. Banana juice also still be served in the afternoon when a scorching day. Guaranteed to quench. Not only oats and pineapple that could be combined with banana juice. There are still many other fruits. Congratulations to create a way to make banana juice. 0 Komentar Untuk "How to Make Banana Juice Special Favor"